The MIT Electric Aircraft Initiative is assessing and developing the potential for sustainable and silent electric aircraft. The environmental performance of aviation has improved significantly in recent decades, but progress in both noise and emissions is becoming more difficult to achieve. Aviation is a particular challenge because the optimal altitude for flight corresponds to the most sensitive altitude of the atmosphere, especially when it come the creation of artificial line shaped clouds called contrails. These effects serve to magnify the impact of aviation CO2 emissions by around a factor of two. In many environmental sensing and national security applications the objectives are similar — efficiency and silence are the goal. And if one imagines a future in which drones fill the skies over our cities, the importance of silence and low or no emissions becomes more apparent. Looking to the longer-term future, we thus seek ways to eliminate or nearly eliminate direct emissions, and to significantly reduce aircraft noise (from drone to commercial aircraft scale). We aim to find out if electric aircraft are the solution. Research spans fundamental propulsion technology development for small drones through to overall aircraft configuration assessment for all-electric commercial aircraft. The focus is on the very long term — technologies that could result in near-silent propulsion and low or no emissions. You can learn more about the overall research areas or read our publications. The initiative is being led by Prof. Steven Barrett from the MIT Department of Aeronautics and Astronautics, who directs the MIT Laboratory for Aviation and the Environment. The MIT Department of Electrical Engineering and Computer Science effort lead is Prof. David Perreault, who is group leader of the Power Electronics Research Group. The Lincoln Lab effort is led by Dr. Thomas Sebastian. The research team is drawn from groups and labs across these units. 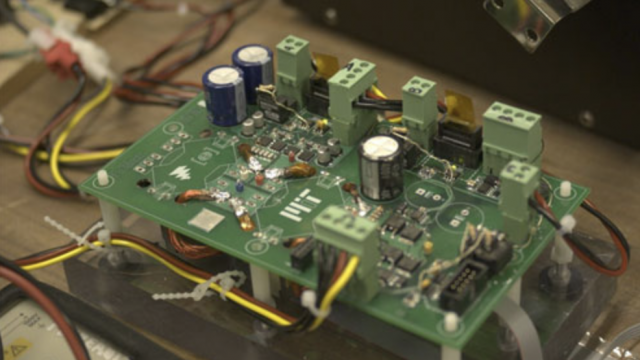 The Power Electronics Research Group systematically investigates physical and engineering issues that are relevant to the transformation of energy and energy production. Specifically, the group is working on making power conversion more energy efficient.